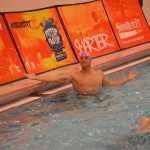 Your swimmer will learn techniques to race FASTER in their freestyle and backstroke races at this high performance swim clinic. Olympic gold medalist Tyler Clary will go over the most important aspects of what your swimmer NEEDS to know in these two technically challenging strokes as well as technique for faster backstroke starts! Freestyle: Learn how to hold a straight and solid body line so that you can rocket through the water with less drag. Keep your head still and low in the water while driving your kick. Tyler will also teach participants how to get an early and powerful press backwards on the water with your pull. You swim freestyle more than any other stroke. Learn how to swim it effectively, efficiently, and fast! Backstroke: Engaging your core not only allows you to swim stronger, but it also allows you to hold the proper body line. 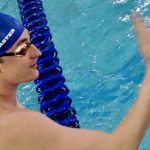 Tyler Clary will help swimmers learn the importance of rotation and how to use it to your advantage for more power in each stroke. Your arm pull in backstroke should press the water to your feet using your whole paddle. Backstrokers are often the fastest kickers on their teams, find out why! Backstroke Starts: This challenging and athletic skills takes a lot of practice to perfect. Accelerate the learning curve by learning drills and exercises from Olympic gold medalist Tyler Clary! He will start by making sure that your swimmer sets up on the block properly so that they can explode away from the wall. Then they'll practice throwing their heads and arms back while arching their backs and getting their hips over the water for a clean entry. You won't believe the improvements you'll see! Swimmers and parents are invited to ask Tyler Clary questions during a Q&A session. Gain insight into his training regimen, diet and nutrition, and recovery tactics. Take a photo while wearing our Tyler's medals, get autographs, and receive a special gift from our sponsors!